The Xolo is an ancient, natural breed, molded by evolution rather than selective breeding. A Xolo is moderate in all aspects of type and conformation, never extreme or overdone. Today the breed serves as a guard and companion. The Xolo possesses a clean, graceful outline, equally combining elegance and strength. There are two varieties, hairless and coated, identical except for coat and dentition. In the hairless variety, the principal characteristic is the total or almost total absence of hair. The coated variety is covered by a short, flat coat. In conformation, all three sizes are lean, sturdy, well muscled with a spacious ribcage, and moderate bone. The Xolo outline is rectangular, and the distance from the elbow to ground is equal to, or slightly greater than, the distance from the withers to the elbow. Typical Xolo temperament is calm, tranquil, aloof and attentive. Height is measured at the highest point of the withers. Toy - Height at withers at least 10, and up to and including 14 inches. Miniature - Height at withers over 14 inches, and up to and including 18 inches. Standard - Height at withers over 18 inches, and up to and including 23 inches. Dogs less than 10 inches, or over 24 inches are disqualified. The body is slightly longer than height, in a 9/10 ratio measured from the point of the shoulder blade to the end of the rump. Medium, oval shaped bone is desirable. All three sizes exhibit moderately balanced proportions, and appear strong, sturdy, and well covered with smooth, flat muscle, but never coarse, heavy or over-muscled. Expression - Thoughtful and intelligent, vivacious, conveying the noble and faithful character of the breed, will show distinctive brow wrinkles when at attention. Eyes are almond shaped, medium size, neither sunken nor protruding. The color varies from yellow to black, the darker being preferred, but lighter color is acceptable. Both eyes must be of the same color. The eye rims may be less pigmented on light colored dogs. Light or spotted eye rims are tolerated but not preferred. Ears - Large, elegant and expressive, a thin delicate texture, tapering to a rounded tip. Ears are set high and carried strongly erect when alert. Ears not standing erect by one year of age are a fault. The Xolo should never exhibit ear fringe. Cropping is prohibited. Skull is wedge shaped, when seen from above, wide and strong, gradually tapering to the muzzle. Excessively wide or narrow heads are a fault. Skull and muzzle planes are parallel. Stop is not pronounced. Muzzle is longer than skull, straight when viewed in profile. The lower jaw is strong and well developed, free from throatiness. Nose is dark on dark colored dogs, lighter on light colored dogs. Lips are thin and tight. Bite - Scissors bite. In the hairless variety, the absence of premolars is acceptable. Complete set of incisors preferred but lack thereof is not to be penalized. In the coated variety, complete dentition is required. Click Here to Learn about breeder background checks on Xoloitzcuintli breeders if you are looking for Xoloitzcuintli puppies for sale. Click Here to learn how ResearchBreeder.com can help you find healthy Xoloitzcuintli puppies for sale.Xoloitzcuintli puppies for sale. Click Here to order a Breeder or Kennel Background Check on Xoloitzcuintli Breeders that may have Xoloitzcuintli puppies for sale. 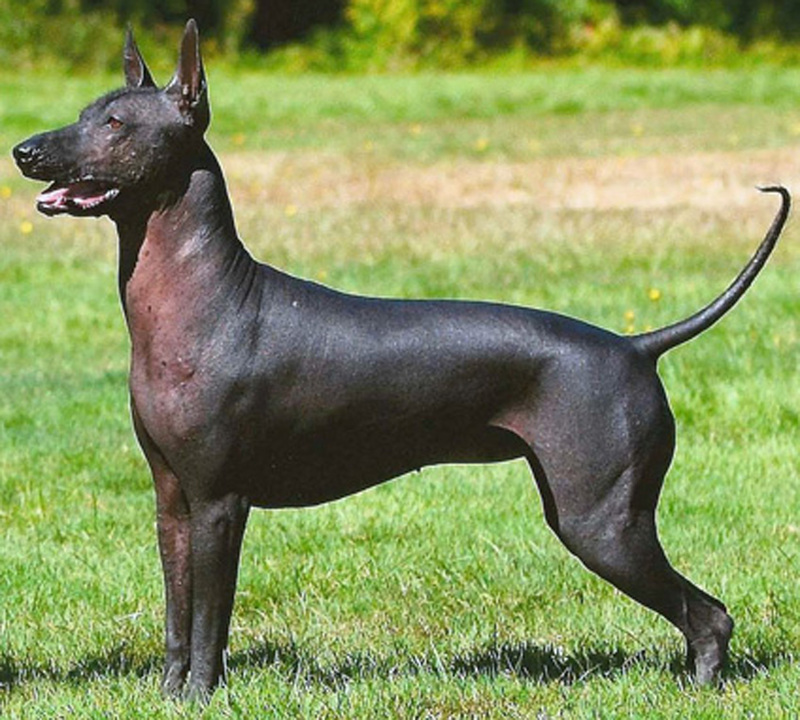 Click here to find the national breed club for Xoloitzcuintli puppies for sale. Click Here to purchase a list of approved ResearchBreeder.com Xoloitzcuintli Breeders who have Xoloitzcuintli puppies for sale.